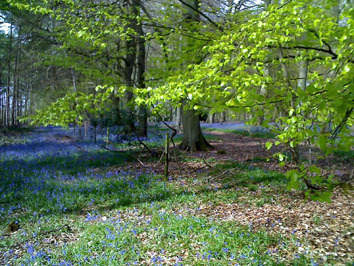 Flowercroft Wood is tucked away in a corner of the parish of Rotherfield Peppard and contains mainly hazel and field maple interspersed with old Forestry Commission conifer plantations. There are over 30 ancient woodland indicator plants in the wood including bluebells, wood anemone, wood sorrel, green hellebore, spurge laurel and wild service tree. Butterflies such as White Admiral and Silver Washed Fritillary can be seen, and the grassy bank on the southern edge has numerous flowers including autumn gentian, twayblade marjoram, dodder, carline thistle, and wild thyme. 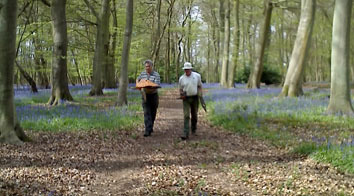 Now in private ownership, the wood is managed to encourage a mixture of broadleaved trees and glades where the conifers are gradually removed. SCGG has been active here from its very beginning in 1998, our tasks including coppicing the hazel, thinning out the larch, removing scrub and clearing back public footpaths. We have removed redundant FC fencing and built stag beetle ‘hotels’ from coppiced hazel. On one memorable day in our early years we were filmed cutting small scrub on the grassy bank by Channel 4 TV, who were making a series on inexpensive methods of keeping fit. Our usual meeting point at the five-bar gate is approached by car either from Cross Lanes or from Kent’s Hill, but the road is narrow and can be muddy. Newcomers should phone in advance for advice on access.